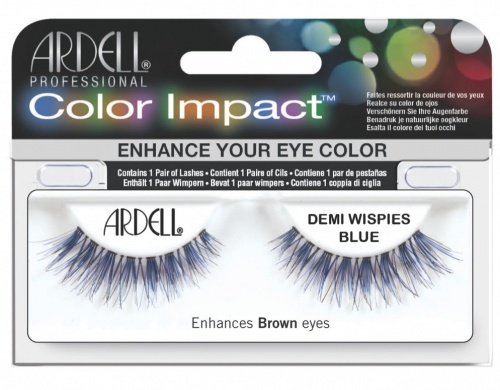 Transform your eyes with fun and flirty Ardell Professional Natural Multipack Demi Wispies eyelashes. 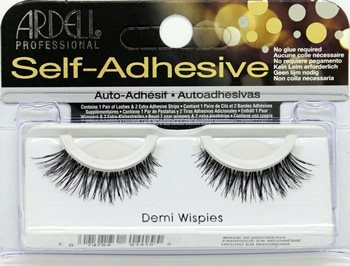 Ardell Demi Wispies lashes provide an authentic natural criss-cross seen in real eyelashes. 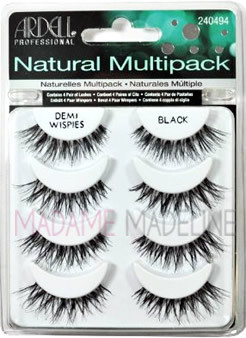 This wispy style is comparable to Ardell Fashion lashes #120 Demi Lashes and Bullseye Just a Girl JOAN lashes. 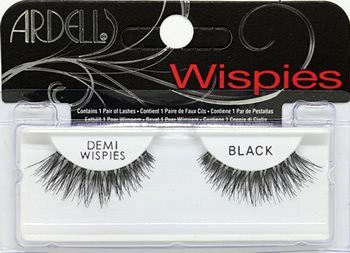 Easy to apply and stunning to behold, Demi Wispies are a great way to enhance beauty by adding new dimension to your eyes. So go ahead and make an impression. Apply Adhesive: Apply a thin line of quality adhesive along lash band. Wait 30 seconds to set before applying.. Apply Lashes: Secure lash band by pressing onto lash line close to your natural lash line as possible. IM IN LOVE WITH THESE LASHES THEY ARE THE BEST TO WEAR!!! IM IN LOVE <33333 . I RECOMMEND THESE LASHES... THEY LOOK SOOOOOO NATURAL ! :) [MY ONLY ISSUE IS..MY EYES ARE TO SHORT! SO I HAVE TU CUT SOME OFF THE SIDE :( ] BUT QUALITY IS A 5!! The quality for the price can't be beat. These are perfect if you want something just a tad bit dramatic but not over the top. I use these mainly for special occasions but I have thrown a pair on when I want that extra touch of bam!. I generally prefer Ardell lashes over many other brands because The texture of the lashes are a little softer. I Will buy again when these are used up. I have ordered so many packs already and I'm IN LOVE. They are nice and natural that I started wearing them everyday for school and work. I get so many compliments and to me it completes my makeup look. I don't even add any eye liner sometimes. I just add a little bit of eye shadow to my eye lashes and add mascara to my bottom lashes and I'm ready for my day. I am not even a pro at applying falsies but these are so easy. Definitely recommend and will keep repurchaseing over and over! I'm experimenting with lashes trying to find out which ones I like more/better than others. I have little eyes and these lashes fit all the way across my eyes. They worked and looked pretty good. I guess I just thought since my eyes were smaller than most people that they wouldn't stretch across my whole eyelid . but they did. They also came in earlier than I expected , I liked that. Anyways, I'll be wearing them again then order more!! and I would recommend them ladies! I love the 4 pack!!!! Doesnt look natural on my eyes. I have short straight blah lashes so I have gone through many types of false lashes trying different styles but I don't like the other false lashes that are too regular in lash pattern because it looks pretty fake. 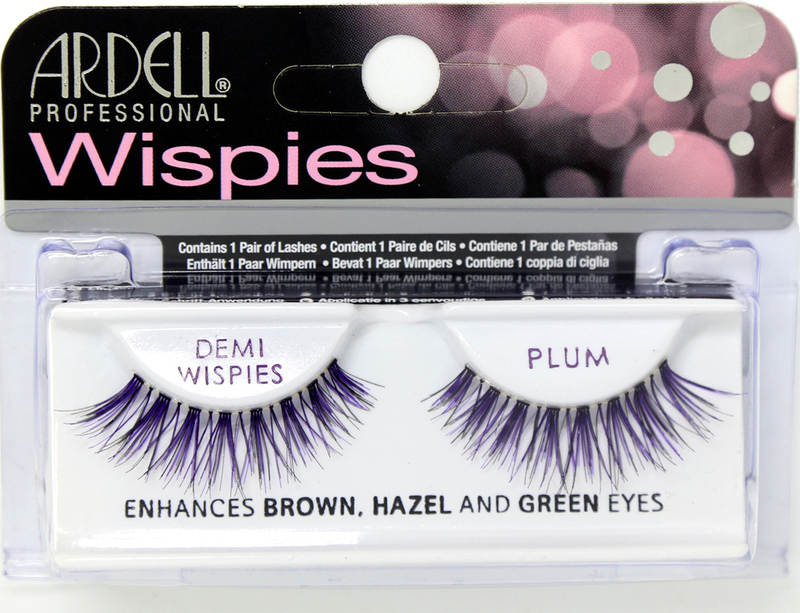 These lashes are a little too long for me but are still pretty and natural looking because of the wispy style these are great every day lashes and good value in this purchase. Very Satisfied . I thought it was a good deal so I bought these and I don't regret it one bit . I love the style, I love the fit, they're nice and natural. You may want a touch of eyeliner. I a beginner so I bought these to practice with. I'm still not doing a great job, but I'll keep trying.